« So sick of Troy Aikman. Get him out of here. 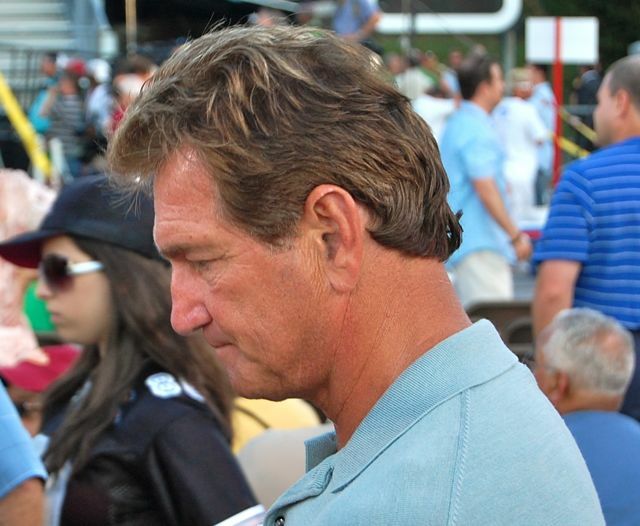 Joe Theismann, at the 2008 Hall of Fame induction ceremony of Art Monk and Darrell Green, is one of the best ex-Redskin analysts working on TV and radio. Photo by Mike Frandsen. The Redskins may have more ex-players working on TV and radio than any other NFL team. I made a list of all the former Skins with a brief summary of what they’ve done as well as a critique. Click here for my complete article on Examiner.com. Overall, the best in my opinion are Sonny Jurgensen, Trevor Matich, Mark May, Brian Mitchell, Joe Theismann, and Rick “Doc” Walker. In my opinion, John Riggins is overrated as a commentator but some may disagree. A couple of interesting ones — Dexter Manley has his own show, “Dexter’s Rush Hour,” which is irreverent, sometimes pretty bad, and other times, surprisingly must see TV, even though it’s only on the web; and a long-forgotten kids TV show called “It’s Elementary,” by former Redskins receiver Roy Jefferson (view the vintage video here). Lavar Arrington, LB (2000-05) – Arrington has come into his own as a broadcaster, doing afternoons on 106.7 FM, “the Fan.” Arrington’s personality comes through and his knowledge of the Redskins is excellent. Arrington also shows enthusiasm for basketball, and he’s working on hockey, though baseball is an area in need of major improvement. The former linebacker has recently begun writing snippets for the Washington Post, and he’s showing a knack for writing as well. Unfortunately, neither L.A. nor his co-host know enough about Redskins history before, say, the mid-1980s, which is a glaring oversight because the Redskins have such a great history from the ‘70s and ‘80s. Needless to say, Arrington’s knowledge of D.C. area sports before 2000 is sorely lacking. Roy Jefferson, WR (1971-76) – Jefferson hosted a children’s show in the late 1970s called “It’s Elementary.” See the vintage video here. This show was similar to “Wonderama” and “It’s Academic,” and Jefferson was such a good host, many children didn’t even know he used to play for the Redskins. Sonny Jurgensen, QB (1964-74) – Jurgensen has been doing color commentary on Redskins games on the radio since 1981 with Huff, and for 24 seasons was part of the “Sonny, Sam, and Frank” team. Jurgensen is uncanny for his ability to call a play before it happens. Jurgensen is the dean of Redskins on the air. In the late ’70s and ’80s, he co-hosted the interview show “Redskins Sidelines” with the late Glenn Brenner, and also interviewed players and coaches with Brenner in the ’80s. Jurgensen also did games on CBS in the ’80s. Dexter Manley (1981-1989) – Dexter has resurfaced after being out of the spotlight for many years and has a show called “Dexter’s Rush Hour” on the web. The irreverent show features skits, puppets, interviews, and predictions. His personality comes through and he makes some surprisingly astute observations. Before the season started he predicted LaRon Landry would have a great year. Before the Dallas game he said that the Cowboys think they’re better than other teams. “Redskins vs. the Dallas Cowgirls…,” Dexter rambled on. “You must be willing to run over your grandmother, your mother, your sister, and your little sister, and all your other sisters out there, you got a lot of illegitimate kids, run over them, run over dogs, cats, whatever it is, you run over them to go beat the Dallas Cowboys on Sunday night.” The show can be a little cringeworthy at times, but it’s also refreshing to see Dexter being Dexter again, and good to have a Redskin call out the Cowboys as the rival that they are. Trevor Matich, C (1994-96) – Matich works on Comcast SportsNet’s excellent Redskins post-game show and also provides analysis on college football for ESPN on TV and radio. Matich’s attention to detail is very thorough and he has quickly become on of the best football analysts in the country. Mark May, T (1981-89) – May has been a regular on ESPN’s “College Football Scoreboard” for the last 10 seasons. He knowledge about college football is extensive, and his pairing with Lou Holtz works exceedingly well. May is one of the premier college football analysts in the country. It’s fitting that the former Outland Trophy winner is also a standout analyst for college football instead of the NFL, though May was a very good guard for the Skins. Brian Mitchell, RB (1990-99) — Mitchell does a superb job of analysis on Comcast SportsNet’s Redskins post-game show. Mitchell has always been outspoken and brutally honest. In the early years after his retirement, he almost seemed to enjoy the Redskins’ poor play, probably because owner Dan Snyder let Mitchell go a few years too early. That bitterness is mostly gone, but Mitchell has clearly become the most knowledgeable former Redskin about the team. Mitchell tells it like it is. He also has worked for both D.C. sportsradio stations and puts in a fair effort at covering other sports. John Riggins, RB (1976-79, 1981-85) – Riggins worked as a panelist on George Michael’s “Redskins Report” for many years, co-hosted a daily show on Sirius NFL Radio, and in recent years has hosted various radio and Cable TV sports shows such as Riggins Post Game Xtra. This show appears to be on MASN as well as the web. Riggins has often been entertaining and outspoken with a strong personality, but also lacks depth and insight into the technical aspects of football, especially for a former player. Think Mike Ditka. (However, many fans disagree with this assessment and love Riggo as a media personality). Finally, here’s Riggins’ YouTube video in which he says former Skins coach Jim Zorn is a high school coach. It was a little unnecessary to pile on like that. Joe Theismann, QB (1974-85) – Theismann has been one of the most articulate, enthusiastic, and knowledgeable ex-players in the NFL since he retired after the 1985 season. In fact, in January 1985, while still active for the Redskins, Theismann did color commentary on Super Bowl XIX on ABC. From 1988 to 2005, Theismann worked on Sunday Night Football telecasts on ESPN, and called Monday Night Football games the following season. In 2007, Theismann was replaced by Ron Jaworski on MNF, a questionable decision despite the fact that Jaworski is a one of the best game analysts around. Theismann surely could have continued to be one of the top color commentators on NFL or college games but declined offers. He currently does Thursday Night games on the NFL Network and contributes to various radio sports talk shows. Theismann is still one of the best NFL analysts and could easily step into a top position calling games and wouldn’t miss a beat. Rick “Doc” Walker, TE (1980-85) – Walker got his start as soon as his football career ended, as a reporter for Channel 4 under George Michael. In those days, Walker was overly enthusiastic, as he tried to ham it up for the camera with a little too much Hollywood. Within a few years, Walker developed a more authentic delivery with substance to go with his style, and he has been a regular co-host on Sportsradio WTEM for most of the past 20 years. Walker, like Mitchell, is honest in his opinions. He’s an expert on the Redskins, and, like Riggins and Theismann, is a link to the glory days of the 1980s. Walker has also done ACC football and a variety of local cable TV shows. His basketball knowledge is passable. Along with Mitchell and Matich, Walker does a first rate job of analysis on the Redskins Postgame show on Comcast SportsNet, currently the best of all Redskins shows. To see the complete list, click on the Examiner.com article. This entry was posted on October 13, 2010 at 7:01 pm and is filed under Uncategorized. You can follow any responses to this entry through the RSS 2.0 feed. Both comments and pings are currently closed.